Today's Chicago Sun-Times points out the typically disparate media coverage given to missing Black women. The search for missing pharmaceutical sales rep, Nailah Franklin just may be the tipping point for change in media coverage for missing women who are Black. Before Nailah's case, a blog authored by Deidra over at Black and Missing but not Forgotten, was posting information on many Black women who'd been reported missing. Thanks, Deidra. Nailah means "one who succeeds." In a very bizarre way, Nailah succeeded in capturing the hearts and minds of many so that missing Black women will matter to the media also. The remains of Nailah Oliani Franklin were identified today. There was obviously trauma in her transition from the physical world. I am so deeply saddened by this loss of life that there are no words to convey the myriad of feelings I am experiencing. Why college newsrooms are often neither diverse nor racially sensitive. When the Kansas State Collegian failed to send a reporter to cover the Big 12 Conference on Black Student Government in 2004, the school's Black Student Union didn't take the snub lightly -- after all, the event had attracted 1,000 participants to K-State's campus. The controversy soon escalated. Meetings were held between minority groups and the white editors of the Collegian, who apologized repeatedly for their misstep. Complaints about a pattern of poor coverage persisted and eventually the administration reassigned the paper's longtime faculty advisor. That action led to a free press lawsuit against K-State that is still pending. "The staff can be all white, for all I care," Natalie Rolfe, the Black Student Union president, said at the time, "but they need to be diverse in their minds." 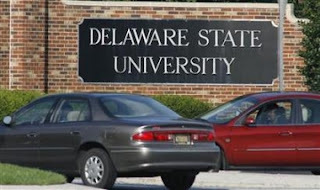 Delaware State University administration quickly shut down access in and out of campus after two students were shot early Friday morning. Both shooting victims are 17-years old. The shooting occurred on the Campus Mall between the Memorial Hall gymnasium and Richard S. Grossley Hall, an administrative building. It is likely that the male victim may know the shooter. The female victim is in serious condition. Click here for info from Yahoo News. Black balloons marked the site and a message was sent. Injustice will not be tolerated. Operation Hope for Jena 6 was seen throughout campus Thursday evening as about 100 Carbondale community members marched in support of the six black high school students from Jena, La., who are being charged with second-degree aggravated battery and second-degree attempted murder, after many racial incidents beginning in August 2006. The highly publicized ordeal began when white students hung three nooses from a tree on the high school campus after seeing black students sitting underneath it the day before. The SIUC chapter president of Generation Change, Christina Colon, said she was upset that she only heard about this a few weeks ago. "We get five minutes, if that, about racial discrimination going on," Colon said. "We felt we needed to do something about it." Melodi Green, a third-year law student from Peoria and partial organizer of the march, said this injustice will not be tolerated. "Stop the injustice. Stop the injustice now," Green said. 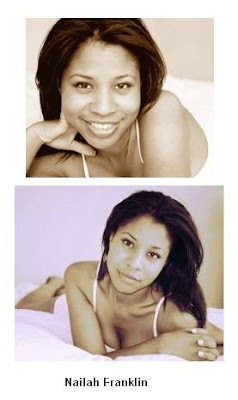 Nailah (Nigh-eel-luh) Oliani (Oh-lee-ahni) Franklin, 28, has been missing from her University Village (near south side of Chicago) condo and from her job as a pharmaceutical sales representative for Eli Lilly since Tuesday evening, Sept. 18, 2007. She has not been heard from since Tuesday afternoon/evening, missed an important "ride-around" meeting with her sales manager on Wednesday, and has not responded to numerous attempts to contact her via phone, email, text message and visits to her condo. Her company car, a BLACK 2005 Chevy Impala is missing, as are her personal and work laptop computers. Nailah is a graduate of 1997 Homewood-Flossmoor High School and a 2001 graduate of the University of Illinois at Urbana-Champaign. She is a successful professional, home owner, doting aunt, loving daughter, sister, cousin, niece and friend and would NOT just up and disappear on her own, or go without contacting anyone for days. Please spread the word about this case, especially if you live in the Chicago area. If you have any information, call Chicago Police at 312-746-9259. After the Jena 6 March: Now what? Today is the day after the big protest in Jena, Louisiana. Now, what happens? When will Mychal Bell be released? What happens to the people of Jena? Surely, these incidents, considered blown out of proportion, have affected residents forever. Prayerfully, the U.S. Department of Justice will investigate this situation. There is something very wrong when the DA threatens students by telling them he can ruin their lives. How is it that Jena residents see no problem with that? It is mind-boggling. Everyone in Jena needs to check themselves. It is a racist town. Is every white person in the town racist? Probably not but when a student at a public school feels as though he must ask permission to sit under a tree considered to be the "white tree", that's evidence of a racist environment. When nooses are hung on that tree and principal's decision to suspend the white students is overturned, that's a racist environment. It's important to note that those students received a three-day indoor suspension according to CNN. Indoor suspension means they came to school every day but not allowed to attend their regular classes. Justin Barker was attacked by black students but Robert Bailey was attacked by whites two days before the attack on Barker. Barker attended an activity hours after the attack so how severely could he have been beaten? Two wrongs don't make a right but sometimes you just get tired of being sick and tired. The black teens were subjected to guns drawn on them and whites not being punished. How can that be justified? After these incidents, the parents of some of the Jena 6 allowed their sons to play in the championship football game for Jena High School. Why? What's the lesson there? The teens were not arrested until after they helped win the championship for the school. That's a shame; talk about misplaced priorities. I've lived in a small Southern town so I understand the mindset. The white Jena residents actually believe they've done nothing wrong and this incident is blown out-of-proportion rather than seeing it as exposing the ugly truth. There's a saying that "you can't fix what you don't face." All of the folks in Jena need a reality check and an honesty session. Jena needs to live what it professes because it's not happening now and it wasn't happening back in August 2006 when racism reached a boiling point. I was so moved by the historical pilgrimage made by blacks and whites. Eyes must remain on Jena; let's not allow it to become the cause of the moment. To the people of Jena, I pray for understanding, tolerance and respect in your town. You can overcome this if you truly open your hearts and minds. Today, protesters will descend upon Jena, Louisiana by the thousands. Those unable to attend in person will wear black to symbolize support for the Jena 6 and unity with the marchers. The awesome significance of this latest demonstration may be lost on many but is captured by Howard Witt's latest article in the Chicago Tribune. Do click here to check it out. You see, the methodology of civil rights protest has forever changed and the internet is the reason for the paradigm shift. 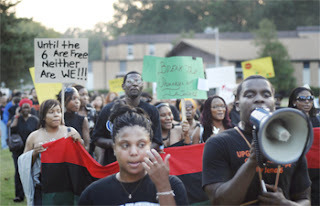 I joined a group of bloggers, the Afrosphere Jena 6 Coalition, in the Day of Blogging for Justice back on August 30. I've never met these folks in person or even talked to any of them on the telephone but the positive change effected, without a "meeting", was awesome. Witt is so correct in framing the position of traditional civil rights leaders like Jesse Jackson and Al Sharpton and organizations like the NAACP. For them, the Jena 6 issue was a game of catch up. Well before the traditional civil rights leaders got involved, folks like Yobachi over at Black Perspective and Villager at the Electronic Village had sent up the drum call to black bloggers and black bloggers answered. Similar actions were the reason Paris, Texas teen, Shaquanda Cotton was released. I will not be in Jena, Louisiana today and I will try to keep abreast of the day's happenings. Most definitely I am wearing black. I send up prayers of love and peace for those who make the journey to Jena. There is no single leader. There is no agreed schedule. Organizers aren't even certain where everyone is supposed to gather, let alone use the restroom. The only thing that is known for sure is that thousands of protesters are boarding buses at churches, colleges and community centers across the country this week, headed for this tiny dot on the map of central Louisiana. What could turn out to be one of the largest civil rights demonstrations in years is set to take place here Thursday, when Rev. Jesse Jackson, Rev. Al Sharpton, Martin Luther King III, popular black radio talk show hosts and other celebrities converge in Jena to protest what they regard as unequal treatment of African-Americans in this racially fractured Deep South town. Yet this will be a civil rights protest literally conjured out of the ether of cyberspace, of a type that has never happened before in America -- a collective national mass action grown from a grass-roots word-of-mouth movement spread via blogs, e-mails, message boards and talk radio. Jackson, Sharpton and other big-name civil rights figures, far from leading this movement, have had to scramble to catch up. So have the national media. Chicago, Illinois – September 17, 2007 - The decision by the Louisiana Court of Appeals to overturn the conviction of Mychal Bell, one of the "Jena 6," confirms the long-held belief by Alpha Kappa Alpha's international president, Barbara A. McKinzie, that the charges levied against the young man were motivated by "prosecutorial overzealousness." She said the dramatic turn of events should strengthen the resolve to demand "justice in Jena." To that end, she urged Alpha Kappa Alpha's 200,000 members—and all fair-minded citizens—to fire off letters to Louisiana Gov. Kathleen Blanco and Attorney General Charles Foti and demand that they wield their constitutional power to call for a new trial. McKinzie said that on behalf of the membership, she is sending a letter to the U.S. Department of Justice asking that federal officials intervene and investigate this issue to make sure the constitutional rights of these young men are protected. She also asked all members to wear black on Thursday, September 20—the day of unity set aside to show support for the Jena 6. McKinzie cautioned those hailing the decision to "stop celebrating" since the fates of the six young men still hang in the balance. "Driven by a racist dynamic in the city of Jena, Louisiana, the district attorney who levied the charges is guilty of prosecutorial overreach," declared McKinzie. "Because lives are at stake, we demand that the governor, the attorney general and the U.S. Department of Justice launch an immediate investigation and right this judicial abuse of discretion. These boys are entitled to their constitutional right to fairness. Right now, the scales of justice are heavily tilted against the young men." McKinzie said the meting out of punishment that is disproportionate to the "crime" has marked the entire Jena 6 saga. She noted that the decision to lower the punishment against the white youth who hung nooses on a tree in an apparent protest of a black youth sitting under the "whites-only" tree set the tone of unfairness that has marked the entire series of events surrounding this case. "Levying a light punishment against these whites and dismissing it as a 'prank' while imposing harsher charges against the black students illustrates an unfair mindset of which school authorities and prosecutors are guilty," McKinzie said. "An investigation will, hopefully, expose this imbalance and will result in a reexamination of this matter and a dismissal of all charges." She also took the occasion to place culpability on school authorities, the district attorney and parents for relinquishing their responsibilities and allowing this matter to escalate to a "national disgrace." "The Jena 6 case illustrates misplaced values, erosion of morals and relinquishment of parental responsibility. Because these principles lie at the core of Alpha Kappa Alpha's platform, we must address these issues if we are to engage in an honest dialogue and learn the lessons that this case presents." McKinzie said that lost in the furor swirling around this case is the fact that the incident for which the students were eventually charged happened prior to the football championships. "Some of the students charged were members of the winning team and were allowed to play so they could be used for their athletic prowess," she noted. "Once the championship was secured and the trophy hoisted, the boys were no longer of use to the school. That's when the prosecutors descended upon them and the charges were levied." McKinzie said that the "glorification of athletics" outweighed the alleged crime and minimized the incident until the boys had been used for the school's athletic gain. "If the charges had been that severe, the LaSalle Parish district attorney would have arrested the youth prior to the game rather than wait until afterward. This is symptomatic of a larger societal dynamic that glorifies athletes when it's convenient and then derides them when their purpose is met. It is a double standard that sends a mixed message about our priorities." McKinzie also faulted the parents on both sides of the issue for not being vigilant and for not monitoring their sons' behavior. "Parents are empowered with the task of raising their sons and teaching them character and infusing in them values that would help them avoid situations like these. If the parents had been doing their jobs, this would not have imploded to the level where the boys' lives and futures are at risk," she said. McKinzie declared that "as a community, we must reclaim our value system." These realities notwithstanding, McKinzie said Alpha Kappa Alpha is committed to uplifting youth through its Black Male Initiative. The Sorority is also devoted to strengthening the black family. Inspired by this, she said that the specter of these six boys spending years in jail is a dire outcome that is disproportionate to the alleged crime. She also noted that the young men have promising futures and their lives deserve to be spared. McKinzie said, "The future of the black family hinges on the African American male being an integral part of the family unit. If the judicial system removes these young men from their families and sends them to prison on suspect charges, more than six families will be impacted. An entire community will be affected and a nation that could benefit from their talents will also be victimized by these actions." McKinzie added that New Orleans has been the beneficiary of the world's humanity. With chapters in Louisiana and driven by the Sorority's credo to "provide service to all mankind," members donated money to Katrina survivors. Responding to the call to address the need to rebuild homes in the region, Alpha Kappa Alpha members recently sponsored and built two homes for evacuees in partnership with Habitat for Humanity. She added that, in collaboration with the organization Feed the Children, members passed out food to 400 residents. Most significantly, she said Alpha Kappa Alpha decided to cancel a Hawaiian cruise and instead host its Leadership Conference in New Orleans. In making this change, the Sorority pumped $5 million into the economy. "Louisiana has been the beneficiary of Alpha Kappa Alpha's treasure, time and talents and we have provided a boost to its economy," she said. McKinzie said that the Jena 6 scenario threatens to cast a bad light on the state. "This can be reversed with a commitment to fairness and with a resolve by officials to see that justice prevails for the Jena 6." Hon. Charles C. Foti, Jr. I didn't watch this year's MTV Video Music Awards. From reports, Kanye West was nominated for five awards but didn't win any. Here's raw footage of his rant. Can someone provide more background on this? I'm not understanding why this is that a big of a deal to him. This is not the first time West has spazzed out in public. It's so unprofessional and denigrates his talent. West is not the best rapper or hip-hop artist. He sells truckloads of albums and that should be enough for him. Common is a far better rapper than Kanye yet he did not react this way when he's been shut out of well-ddeserved awards. When an artist creates to win awards, we end up with the so-called music we have today. Anyhoo, somebody fill me in if I missed a salient point behiind the VMAs and Kanye's public meltdown.